NOTE: All of these publications are vintage and used; condition varies from near-mint to not-so-hot well-used editions. Please note that these publications come from various sources, and may have been stored in a smoking environment or may have a musty odor. I'll try to note obvious defects, but may miss something. Woman's Day Booklet 1951: Things to Crochet For the Home, Women's Day, 1951. 65- page book with designs including: Prize- Winning Buffet Set, Informal Luncheon Cloth, Tweed Filet Woven Afghan, Cluster- Stitch Centerpiece, Filet and Lacet Tablecloth, Nosegay Doily, Diamond Star Doily, Wheel-Design Doily, Sunflower Doily, Windmill Doily, Popcorn Star Doily, Sunburst Doily, 4H Prize- Winning Doily, Finger- Bowl Doily, Pineapple Motif, Classic Luncheon Set ( placemat and napkin edgings), Diamond- Chain Chair Set (Chair Back and Armpiece), Star Vanity Set (3 sizes doilies), Spiderweb Doily Set (2 sizes), Waffle Design Chair Set, Filet Tray Cloth, Geometric Place Mat, Place Mat of Medallions, and 28 Edgings and Insertions for Lingerie and Household Linens. Small bent bottom corners in last 15 pages of book, but overall very good condition. Star Book No. 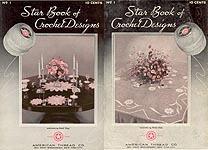 1: Star Book of Crochet Designs, designs by Anne Orr, American Thread Company, 1935. Projects include: Colomial Star Luncheon Set, Cosmos Luncheon Cloth, Iris Luncheon Set, Victorian and Small Alphabets, Chair Sets and Alphabet, Wheel Spread, opcorn Star Spread, Diamond Table Set, Square Vanity Set, Dainty New Edgings, Simple Crochet Edgings, Two Luncheon Sets, Iris Luncheon Set, Fruit Basket Luncheon Set, Chippendale Luncheon Set, Bargello Bag, Round White Purse, Irish Crochet Collar, String of Pearl Collar, Leaf Design Collar, Collar and Jabot, Cosmos Luncheon Cloth, Cosmos Spread, Fringes and Tassels. Very good vintage condition. Star Book No. 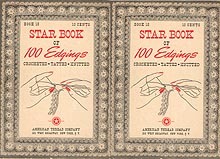 18: Star Book of 100 Edgings -- Crocheted - Tatted - Knitted, American Thread Company, 1942. Some gorgeous edgings and insertions, as well as edgings for altar cloths and robes. Some page yellowing, but otherwise good vintage condition. Star Book No. 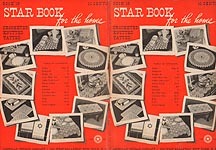 19: Star Book For The Home - Crocheted - Knitted - Tatted, American Thread Company, 1942. KNIT Chair Set; CROCHET Needlepoint crochet, 2 Chair Sets, Daisy Motif Runner, Crochet Doily, Tatted Doily, Doily, Cluny Design Scarf/ Runner, Tatted Scarf/ Runner, Porch Set (place mats in cotton yarn), Lacy Table Cloth, Daisy Lunch Cloth, Filet and Popcorn Bedspread, Bridge Set (Napkins, Cloth, Coasters), Luncheon Set (Placemat, Napkins, Runner. Glass Cozy), Cross Stitch Rug (yarn), Crocheted Rug with Tufted Edge (yarn), Huck Towel Edge, Crochet Trimmed Turkish Towel, Crocheted Flower Basket, Hot Plate Mats, Popcorn Oval Hot Plate Mats. Very good condition. Star Book No. 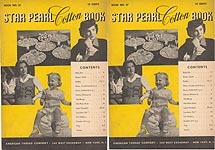 27: Star Pearl Cotton Book, American Thread Company, nd (ca 1940's). KNIT Lightweight Child's Sweater, Little Sister Dress in Knit, Gloves; CROCHET Baby Set (Sweater, Dwarfs' Cap, & Booties), Little Sister Dress in Crochet, Elephant, Ball, Doll, 2 Doilies, Luncheon Set and Dinner Cloth, Luncheon Cloth, 4 Potholders, Hot Plate Mats, 2 Bags, Gloves, Star Stitch Vest, Heart "Gadget", Acorn "Gadget". 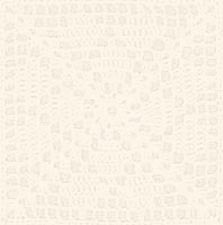 Page yellowing, piece missing from back cover that does not affect the patterns. May smell slightly musty. Star Book No. 30: Tatted & Crocheted Designs, American Thread Company, 1944. Lace doilies, edgings, gorgeous tatted baby cap, place settings, collars, etc. Full how-to instructions for tatting. Pages yellowed, but book otherwise in very good condition. Star Book No. 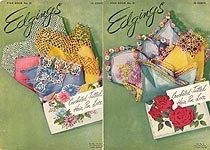 41: Edgings (Copyrighted), American Thread Company, 1946. Nice variety of crochet, tatted, and knit edgings. Overall wear, but otherwise pretty good condition. Star Book No. 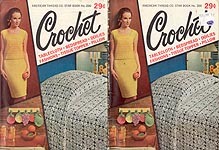 45: Treasure Chest of Crochet, American Thread Company, 1946. ORIGINAL publicaton. Designs include: Maple Leaf placemats and centerpiece, Tatted Doily, Spider Web Doily, Luncheon Set, Buffet Scarf, Antimacassars (Chair Back and Arm sets), Purital Bedspread, Cathedral Windows tablecloth, Charleston Garden afghan (worsted weight yarn), Carnatians, 5 curtain pulls, Hot Plate Mats, and Sugar Spun Flower Basket. May have paper clip indentations in some pages, but overall very good vintage condition. Star Book No. 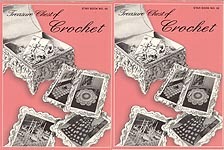 45: Treasure Chest of Crochet, originally published by American Thread Company in 1946, but this is a REPRODUCTION by Timeless Publications, 1993. Designs include: Maple Leaf placemats and centerpiece, Tatted Doily, Spider Web Doily, Luncheon Set, Buffet Scarf, Antimacassars (Chair Back and Arm sets), Purital Bedspread, Cathedral Windows tablecloth, Charleston Garden afghan (worsted weight yarn), Carnatians, 5 curtain pulls, Hot Plate Mats, and Sugar Spun Flower Basket. Price tag smudges on cover, but otherwise like new. Star Book No. 46: Chair Backs, American Thread Company, probably late '40's. Chair back and arm sets -- crochted, knitted, and tatted. Book in excellent condition. Star Book No. 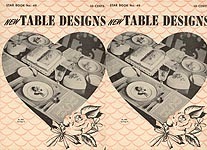 49: New Table Designs, American Thread Company, 1946. Designs include: Sunday Night Supper appliqued place mats, Bridal Shower Irish Rose & Leaf Scarfs, Oval Tea Set, Raised Filet Tablecloth, Tatted Placemat & Napkin Edging set, Mary Mary Child's Luncheon Set with cross- stitched sunbonnet girls, Woven Luncheon Set, Four- Piece Cluster Stitch Set, and Four Piece Filet Luncheon Set with full alphabet for monogramming. Shows some wear, but overall very good condition. May smell slightly of cigarette smoke. Star Book No. 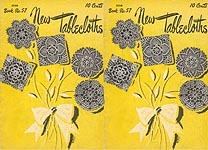 57: New Tablecloths, American Thread Company, 1948. Flower- inspired designs include: Poinsettia Lily of the Valley , Pond Lily, Tulip, Rose Filet, Chrysanthemum, and Daisy Tableclotha; and Carnation, Daffodil, and Philodendron, Luncheon Sets. Cover torn up and down to staples at seam, but overall very good condition. Star Book No. 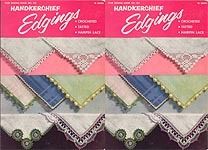 61: Handkerchief Edgings, American Thread Company, 1948. Very good condition. Star Book No. 61: Handkerchief Edgings, American Thread Company, 1948. Overall wear, two holes punched for storage in binding, some small tan spots on a few pages, Everything is here and readable. Star Book No. 65: Flower Edgings , American Thread Company, 1949. 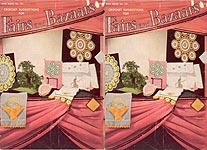 Edgings and insertions for "Handkerchiefs, Tablecloths, Towels, Scarfs, Sheets & Cases, Luncheion Sets, Lingerie," along with a set of glass coasters. Most have a floral motif, but there is one Flower Girl insertion, and also a gorgeous Butterfly insertion. Age wear to cover; tear about 2" up spine -- otherwise, very good condition. Star Book No. 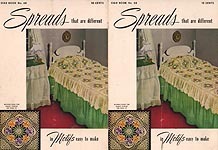 68: Spreads That Are Different, American Thread Company, 1949. Designs include: Shell and Popcorn, Pansy Spread, Cinderella, Snow White, Flower Queen, Sleeping Beauty Bed or Crib Ruffle, Prince Charming. Cover ripped up to 1st staple at spine, has been folded lengthwise, nicks and tears on some pages. Everything is here and readable, though. Star Book No. 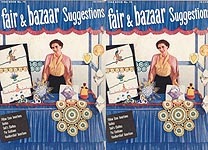 74: Fair and Bazaar Suggestions, American Thread Company, 1950. Pilllow Case edgings & insertions, Doilies, Pin cushions, Handkerchief edgings & insertions, appliques for towels, Hot Plate Mat, dress for 8" baby doll, New Orleans doll door stop. May have name on first page, but otherwise very good vintage condition. Star Book No. 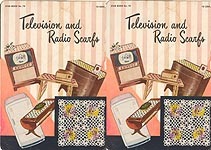 78: Television and Radio Scarfs, American Thread Company, 1950. Motif designs that can be used for runners, tablecloths, chair covers, etc. Cover ripped torn a couple of inches up and down at spine, name written in pencil on cover. Otherwise, very good condition. Star Book No. 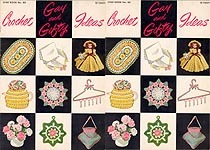 80: Gay and Gifty Ideas, American Thread Company, 1951. Designs include: Rose Doily, Pansy Handkerchief, Plate Edging, Forget - Me- Not Handkerchief, Carnation, Doll Outfit (7 inch doll), Nut Cup & Saucer, Apple Blosssom Corsage, Chrysanthemum, Daisy Corsage, Hot Plat Mts or Covers, Tea Cozy, Corn Pot Holder, Terry Cloth Laundry Bag, Rose Pot Holder, Hosiery Hanger, and Plant Holder. Some slightly "dog- eared" upper edges, but otherwise excellent vintage condition. Star Book No. 80: Gay and Gifty Ideas, American Thread Company, 1951. Designs include: Rose Doily, Pansy Handkerchief, Plate Edging, Forget - Me- Not Handkerchief, Carnation, Doll Outfit (7 inch doll), Nut Cup & Saucer, Apple Blosssom Corsage, Chrysanthemum, Daisy Corsage, Hot Plat Mts or Covers, Tea Cozy, Corn Pot Holder, Terry Cloth Laundry Bag, Rose Pot Holder, Hosiery Hanger, and Plant Holder. SERIOUS CONDITION PROBLEMS: Back cover/last page partially gone -- instructions for half of Plant Holder and Tea Cozy MISSING. 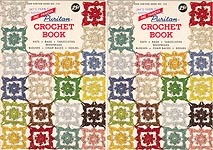 If you are an experienced crocheter, you may be able to figure out the missing section, but I'd suggest if you are interested in making these two patterns, do NOT buy this book! Star Book No. 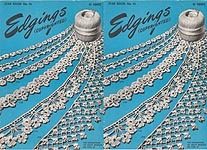 81: Edgings -- Crocheted - Tatted - Hairpin Lace, American Thread Company, 1951. Very good condition. Star Book No. 100: The Famous Puritan Crochet Book, American Thread Company, 1953. 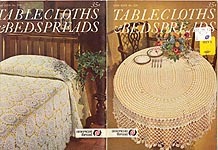 Patterns include: Round and Hot Plate Mats, Basket, Grape Doily, Calla Lily Ruffled Doily, Potholder, Glass Jacket, Place Mat & Napkin Older, Crocheted Popcorn bedspread, Cathedral WIndow tablecloth or bedspread (also good for scarfs and chairbacks), 2 Chair Back Sets, Buffet Set, Pineapple Pincushion, and Grape Bottle Cap Hot Plate Mat. Some wear, but overall very good vintage condition. Star Book No. 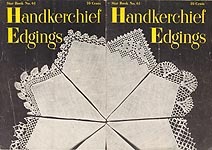 102: Handkerchief Edgings - Crocheted, Tatted, Hairpin Lace, American Thread Company, 1953. Very good condition. Star Book No. 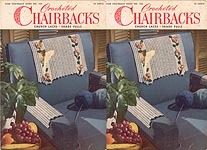 105: Crocheted Chairbacks, Church Laces, Shade Pulls, American Thread Company, 1954. Chair sets: Pansy or Grape, Fan, Bird Filet, Pineapple, Popcorn Stitch, Spider Lace, and Rose Filet; Church laces: Rose, Grape and Chalace, Cross Chair Set; and Puff Stitch, Tassel, Triangle, Pineapple, and Cluster Stitch Fan Pulls. Scar on cover, cover ripped at spine up and down to first staples, age spots on some pages. Star Book No. 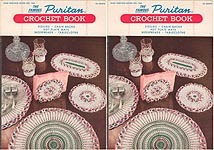 114: The Famous Puritan Crochet Book, American Thread Company, ca 1953. 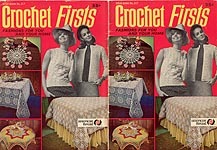 Patterns include: Star Spangled Ruffled Doily, Star and Picot DOily, Modern Motif Chair Set, Crocheted Gloves, Easy Stitch KNITTED Blouse, the Quickly Made Crocheted Blouse, Shade Pulls, 2 elegant dolls (7"), Pearl Encrusted Hat & Bag, Hairpin Lace Stole, Carry- All Case, Slippers, Fold- Away Cloche and Bag, KNITTED Doily, Regimental Striped Luncheon Set, Pink and Silver Spangled Bedspread, Gold and Silver Spangled Tablecloth, Collar, Belt, Chair Set for Modern Homes, Pansy Doily, and Butterfly Stole. Yarn shop stamp on cover, but overall very good condition. Star Book No. 121: Crochet Suggestions for Fairs and Bazaars, American Thread Company, n.d. (probably early 1950's). Patterns include: Black Modern Potholder, Rubber Ring Hot Plate Mat, Pillow Cases (Peacock, Bluebirds, Yellow and White Flowers, Cameo Girl, Basket), Applique Basket and Edgings, Butterfly Corner, Red and White Handkerchief Edging, Ruffled Pondlily Doily, Pineapple Pincushion, Place Mats, Rambler Rose Doily, Overall wear, folded vertically -- good used condition. Star Book No. 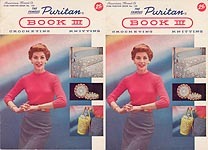 132: The Famous Puritan Crochet Book III, American Thread Company, n.d. but ca 1954. 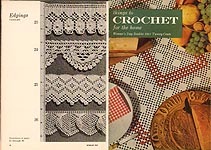 Patterns include: KNIT Blouse; CROCHET Big Round Tablecloth, Drawstring Blouse, Great Big Crocheted Bag, Lacy TV Lamp, Round and Square Pillows, Pansy Doily, Daisy Doily, Three Way Doily (in three sizes), All American Crocheted Bedspread, Junior Hi (7 - 8" doll dress, bolero, & hat), Dog - Cat - Clown Bottle Covers; More Three Way Doilies, The Puritan Bedspread, Maorette Doll (7 - 8"), Puritan Crocheted Tablecloth. Very good condition. Star Book No. 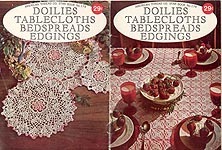 179: Doilies, Tablecloths, Bedspreads, Edgings, American Thread Company, ca early 1960's. Digest- size book. Checkmarks on one page, but otherwise very good condition. Star Book No. 200: Crochet, American Thread Company, nd. Digest- size book with patterns for ladies' Shell & Skirt, Tablecloth, Beehive Canister Covers & Pincushion, Coasters (Round, Grape, Pear). ladies' Crocheted Blouse, Bedspread, Soily, Thread Flowers/ Flower Pillow, Tissue Cover, 3 sizes covers for hot mats, Daffodil Neclkace, Bracelet, & Earrings; and Beach Bag. Phone number in margin of one page. Otherwise, very good vintage condition. Star Book No. 217: Crochet Firsts, American Thread Company, nd. Digest- size book. Two KNIT patterns: Sleeveless Shell and Knitted Blouse. CROCHET: Story Book Dress for little girls, Knitting Needle Case, Hot Plate Mats, Flower Power (Rose, Sunflower) Potholders, Luncheon Mat, Fiesta Cloth, Shell Stitch Jacket, Scroll Tablecloth, Hairpin Lace Shell, Flower Placemat & Petal Coaster, Irish Crochet Roses & Shamrocks Bedspread, Doily, Hairpin Lace Doily, Tote, Pineapple Chair Set, and Pineapple Tea Apron. Some wear and tear, but overall very good condition for its age. Star Book No. 224: Tablecloths & Bedspreads, American Thread Company, nd. Digest- size book. Designs include: Round and Round, Windmill, Oval, and Pineapple tablecloths; and Snow White, Peach Tree Street, All American , and the Puritan bedspreads. Some cover wear, but pages feel like the book has never been opened.